Kitt's World: Wish summer was here. With it being so cold up north my friends and family wish they were here in Florida. It is 75 degrees at the time of this posting and they are at 25 degrees. 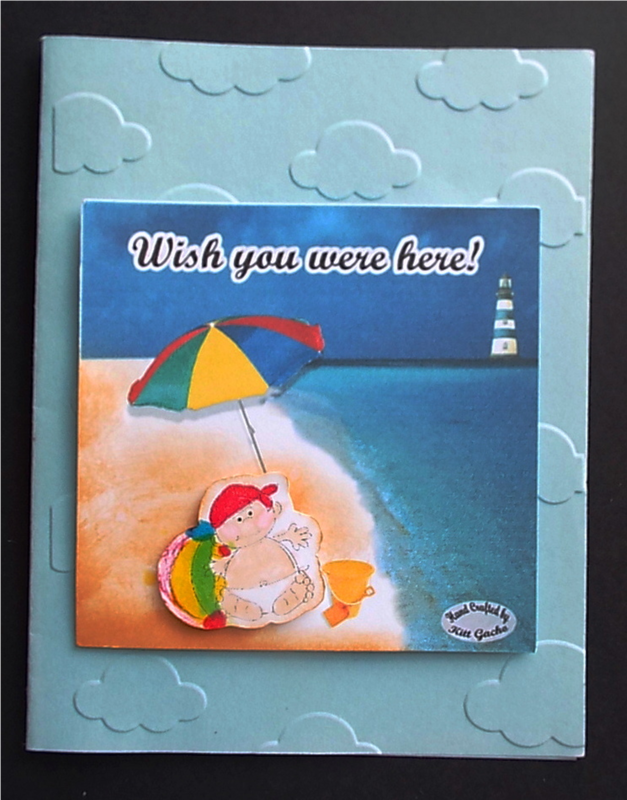 This beach baby image is from Robyns Fetish Be sure to stop by the Give a crafter a cookie challenge for more warm summer inspiration from our talented DT. I used Darice clouds embossing folder on the base of the card and used the Silhouette Cameo to cut and print the background and sentiment. I used Tim Holtz tea dye distress ink to color in the sand. The background image is a digital picture as well as the pail set and lighthouse embellishments. They are from my Scrapbook Max graphic program. Thanks for stopping by today and leaving your comments. I love hearing from you.